Men carry a sarcophagus to the cremation site during the procession for a mass cremation several kilometers from Ubud in Bali. 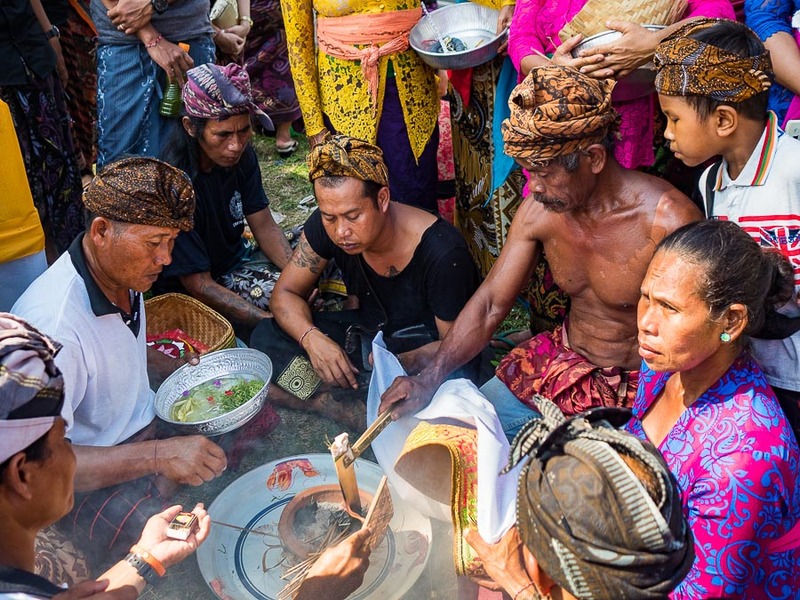 The main reason I went to Bali was to photograph the mass cremations that take place every 3 to 5 years. 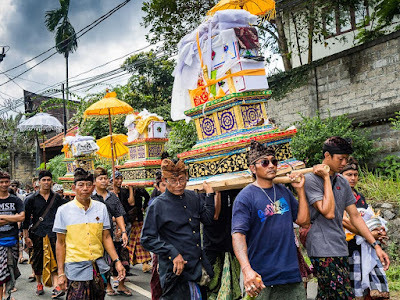 Hindus cremate their dead but cremation in Bali is a very elaborate and expensive ceremony. In most communities people bury their dead, and then when there are a large number of bodies to be cremated, the remains are exhumed and cremated in a community wide ceremony. Women wait for the cremation ceremony to start in the village outside of Ubud. 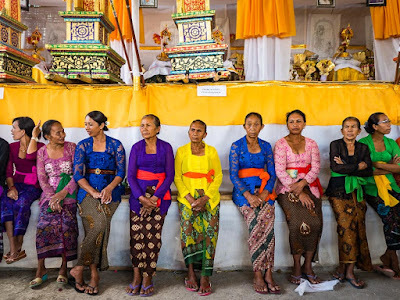 The cremation dates are picked by the Hindu priests in the communities but usually happen around the same time of year, July or August, the beginning of winter in the southern hemisphere. The cremation process goes on for several weeks. 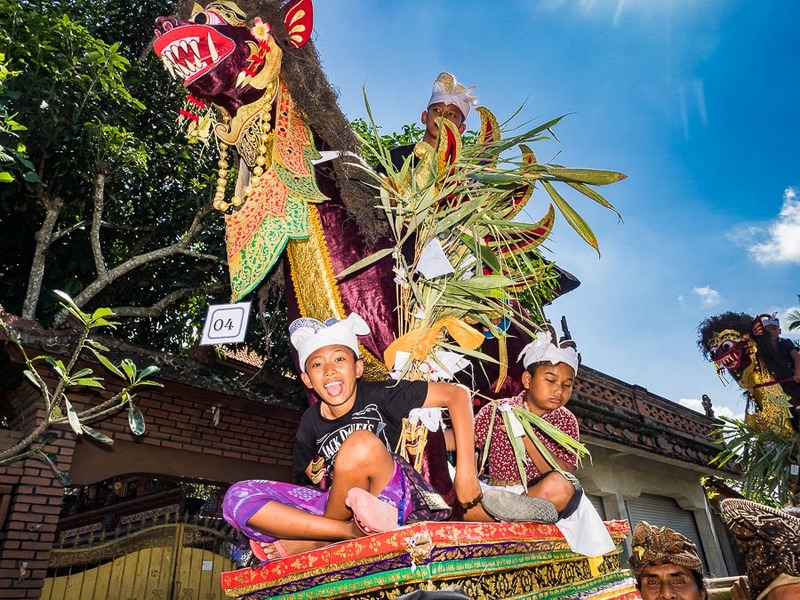 People start making the elaborate sarcophagusses more than a month before the ceremony. The remains are exhumed about a week before the cremation. Then the remains are cremated a few days before the cremation ceremony. The ashes are collected and sent back to the sea. Finally, the effigies of the cremated and their sarcophagusses are cremated. The big event is always the burning of the sarcophagusses. I missed the exhumation ceremonies because I was still in Bangkok when they happened. 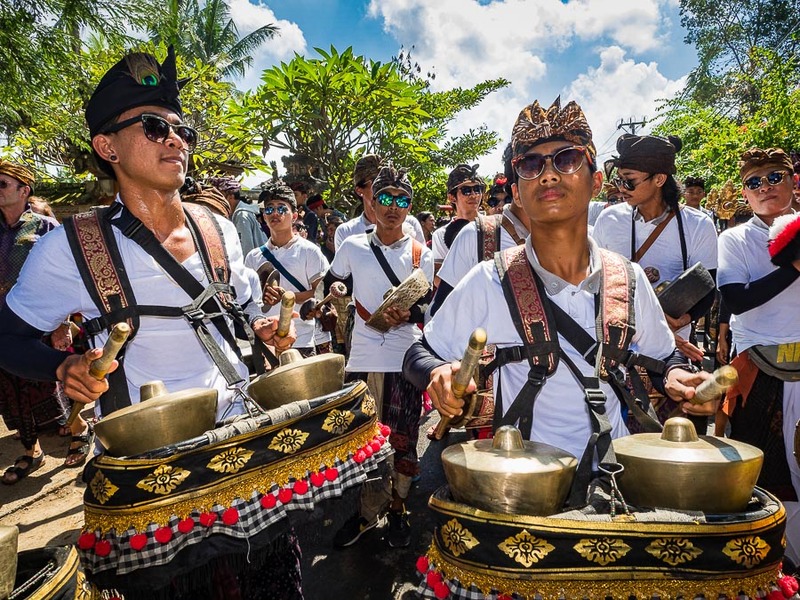 A gamelan orchestra leads to procession of sarcophagusses to the cremation site. Boys frequently ride the sarcophagusses to the cremation ground. The exact nature of the ceremonies vary from village to village. In the small village I went to outside of Ubud there were three processions on the cremation day. The first was the sarcophagusses brought to the cremation site. 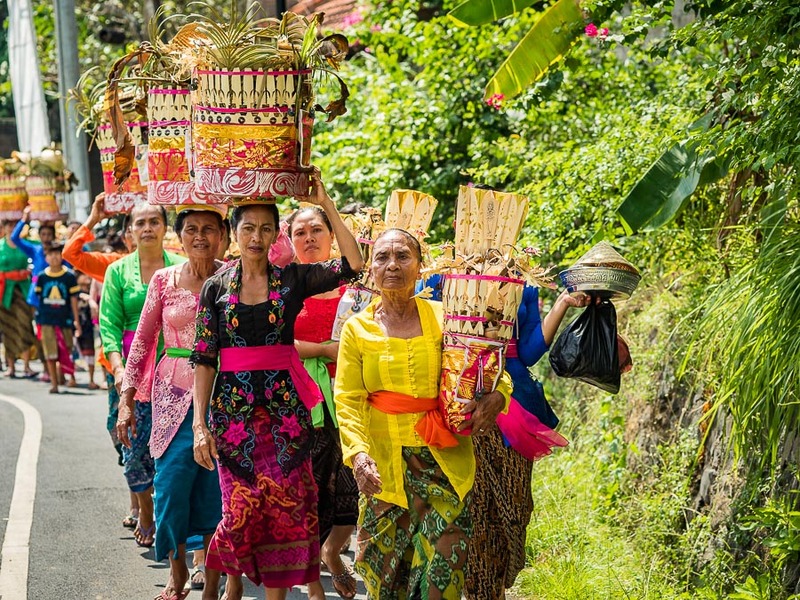 A few minutes later, a procession of women brought offerings to the cremation site. 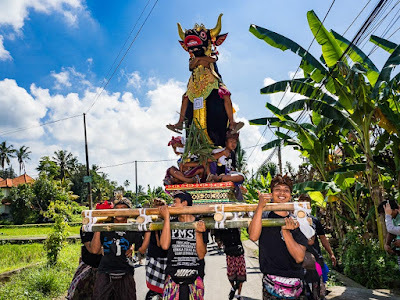 The offering were to help the deceased on their journey. A procession of women bring offerings to the cremation ground. Finally, a procession of men brings the effigies of the deceased (because the remains have already been cremated) to the cremation site. 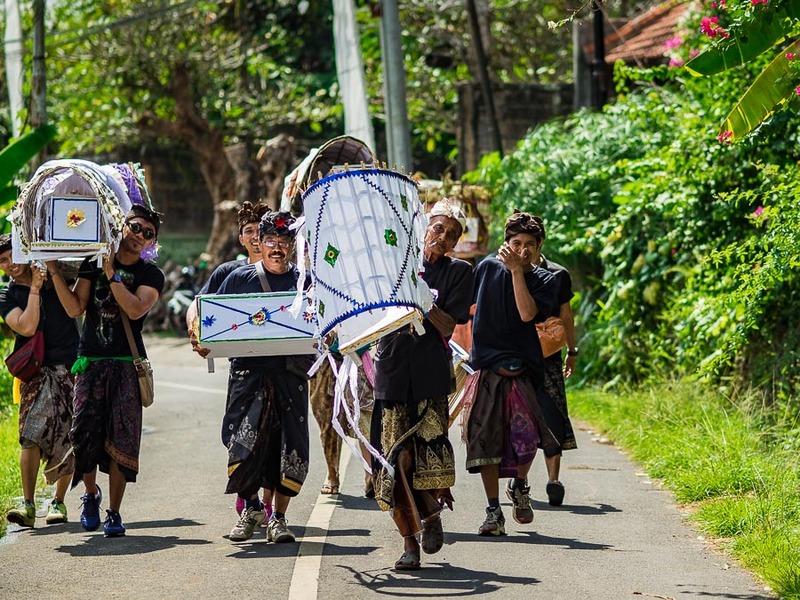 A procession men bring the effigies of the deceased to the cremation site. The ceremony has a celebratory feeling. Not that people are celebrating the death of a loved one, but that they are celebrating their life and passage onto their next life (Hindus believe in reincarnation). It sort of feels like a New Orleans jazz funeral. There is a lot of music and celebration wrapped around the sadness that comes with a loved one's final farewell. At the cremation site, the sarcophagusses are cut open. Hindu priests place the effigies and offerings into the sarcophagusses, which are closed up again and then set ablaze. 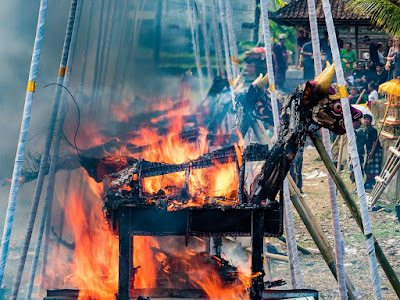 Sarcophagusses burn during the mass cremation in the village outside Ubud. Finally, a small flame is brought from the burning sarcophagus to the family, which gather around it and pray. Family members gather around the flame brought from the sarcophagus and pray. 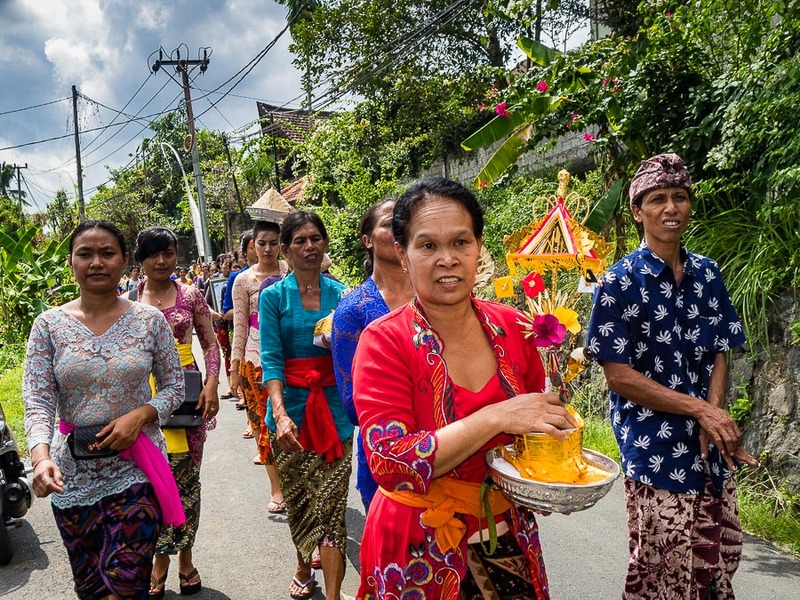 The cremation ceremony I went to outside Ubud lasted a few hours. 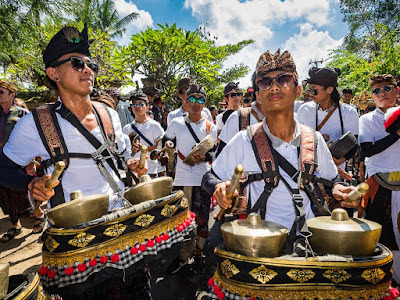 Most of the people at the ceremony were from the village but there were a handful of tourists there and the Balinese were, without exception, gracious and welcoming to the strangers in their midst.